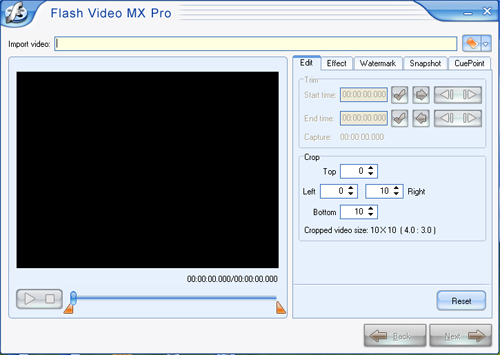 How to Convert WMV to flash ready for the delivery to web page or blog? How to Convert WMV to Flash Video FLV for online delivery? Nowadays more and more people are becoming interested in flash viewing online. The flash (files ending with SWF) is much more popular than before as the format posted on their web page or blog. With this type of file, share videos with your families and friends anywhere around the world. 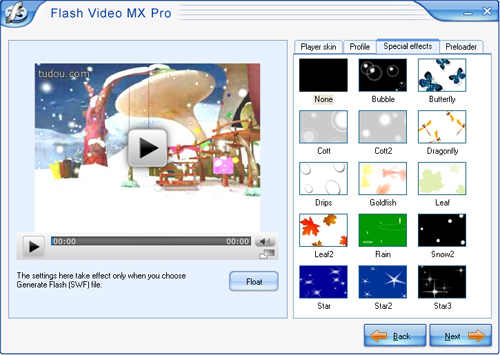 Moyea Flash Video MX Pro is a professional tool to convert pop videos or DVD into flash (SWF files) for the developers or designers. It supports to convert WMV to Flash, AVI to flash, MPEG to flash, RM to flash, MOV to flash, MP4 to flash, 3GP to flash, etc. In addition, FLV also can be generated for the playback with FLV player. 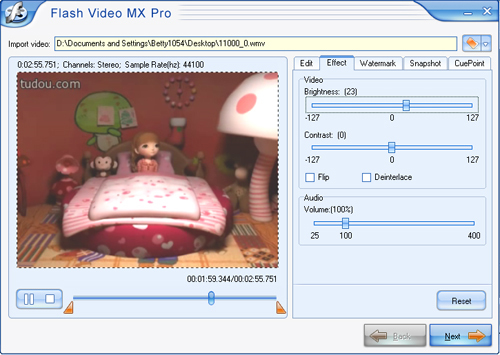 Meanwhile, Moyea Flash Video MX Pro offers the powerful editing function including trimming, cropping, watermark adding, CuePoint, Misc, etc. More choices to player skin are provided. You can modify special effects, preloader, transparency to personalize the video. How to create flash from WMV? This tutorial will show the step by step way to convert WMV to flash ready for the delivery to web page or blog. Launch the program, and the main interface will pop up. 2. Import the videos on your PC. Click the folder icon to import the wanted video from the pop-up dialog-box. a. Adjust the video in “Edit” and “Effect” such as trim, crop, and brightness. b. Add the image or test to the video. Freely select the logo position and the lasting time. c. Capture the image from the video. d. In “CuePoint”, you can add the event or navigation at some point to produce the interaction with other element of the web page such as text display. 3. Specify where to save the converted video on your PC. Click folder icon to choose the location of the output file. Here you can complete the following settings. a. Choose the generated file type. b. Make video & audio settings containing bit rate, frame rate, channels and so on. c. In Misc part, it is allowed to add a video before and behind the original video or replace the original audio. 4. Preview and choose some style or settings for the outlook of the player. a. Choose the style and the transparency of the player skin. b. Check some settings about player skin, playback, navigation and event. c. More beautiful special effects are ready to be chosen. d. Various vivid preloaders are prepared for you. 5. Check the parameters and the settings that you choose. The settings and the path of the video are listed clearly in case of the modification. Start the conversion by clicking “Start” button. It will auto pop up the target folder when the encoding is finished. 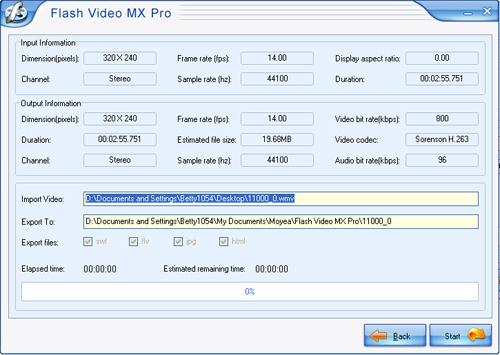 Besides, This Flash Video MX Pro also can convert to other formats to flash as you like including AVI, MPEG, WMV, MPG, MP4, 3GP, XviD, DivX, DAT, MOV, MP3, WMA, OGG, etc. How to put flash video for your website? | How to convert WMV to FLV?